A hint of a squint in the orange tabby hardly seemed cause for concern. Kara Gornik, an ophthalmology resident at the Foster Hospital, was available for an emergency consult the next afternoon. “Musetta was in a lot of pain when she came in,” says Gornik. The cat’s right cornea had ruptured so severely that it was leaking aqueous humor, the fluid between the lens and the cornea that inflates the eye. Barnes had a choice: emergency surgery to remove Musetta’s eye that night and achieve immediate relief or a more-complicated, eye-sparing surgery the next day. 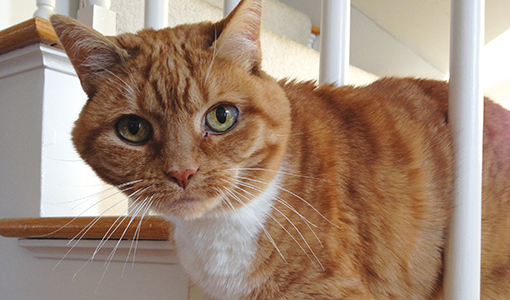 Barnes chose to have the veterinarians keep her cat comfortable and save the eye. With assistance from veterinary ophthalmologist Stefano Pizzirani, Gornik patched the rupture with a graft from Musetta’s conjunctiva, the mucous membrane that covers the outside of the eye and lines the inside of the eyelids. Under an operating microscope that magnified the cat’s eyeball more than five times, she stitched everything back together with hair-thin sutures. The tabby recovered. But then, as Gornik and veterinary ophthalmologist Chris Pirie were examining Musetta’s other eye, they noticed that cornea was starting to thin. To prevent another rupture, they performed a conjunctival graft on the left eye. The second surgery also went off without a hitch. Because of Barnes’ diligent post-op care—four kinds of eye drops, four times a day—both of Musetta’s corneas are nearly normal.